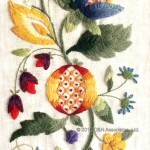 This was my introduction to fabric painting and journal cover making. 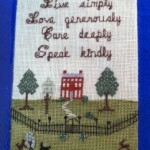 Another project that the Oatlands (Virginia) chapter of EGA offered to its members (I think in spring 2011). Stitched 1968 (I stitched the date at a corner). I wonder if this was an early Elsa Williams kit? 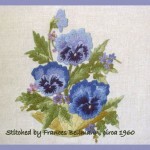 My sister and I have the same design stitched by our mother, Frances Bellmann. Where Carol’s bowl of pansies has pink and lavender buds mine has a darker purple. I believe this is Elsa William’s circa 1960. 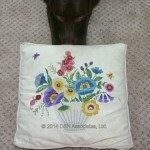 My sister has this worked design stitched by our Mother. 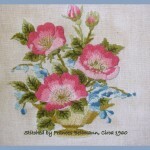 The stems are chain stitch as is the vase. 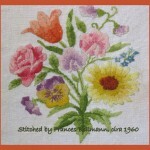 Roses are straight stitch with French knots.Frances Bellmann, my mother enjoyed working Elsa Williams. Circa 1960. 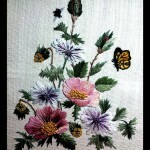 Stitched by my mother, Frances Bellmann in the 1965(?). I believe this is an Elsa Williams design but I am not sure. Wool yarn, design size is 8.5 inch by 9.5 inch. 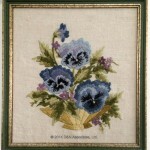 17 inch square Belgian linen fabric, design size is 8.5 inch by 9.5 inch. 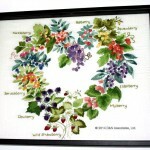 Wild Berries Crewel Embroidery Kit, by E. Rush for Elsa Williams. 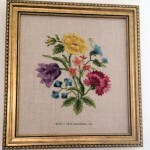 I used a shadow box frame, 16 inch x 20 inch.